I did not save a spider yesterday. Did not save one today, either. 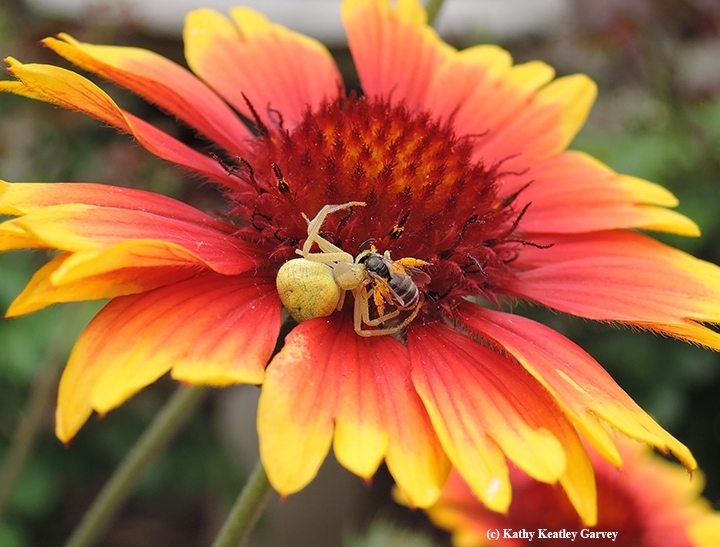 Wednesday, March 14 was "Save a Spider Day" in the United States, according to a post by the Entomological Society of America (ESA). Darn, I missed it! 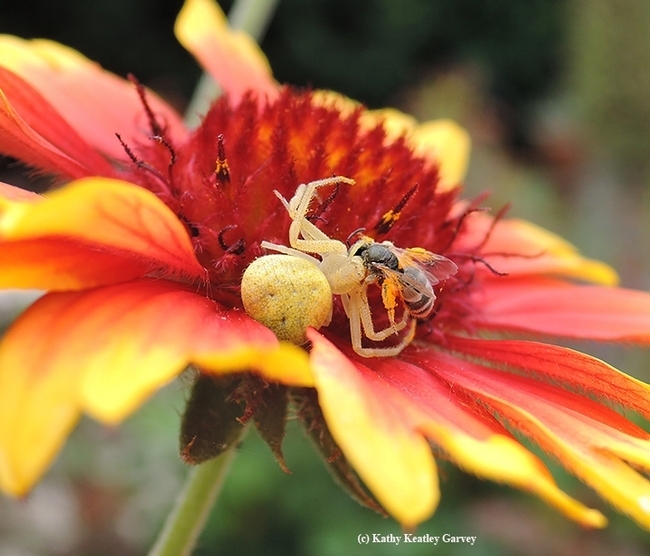 ESA usually focuses on insects (spiders are not insects) but ESA is all inclusive in this welcoming world of arthropod diversity. "March 14 is Save A Spider Day in the U.S. and while Charlotte and Peter Parker have been fighting the good fight to redeem the spider's reputation, arachnophobia is still running rampant, especially in the United States. 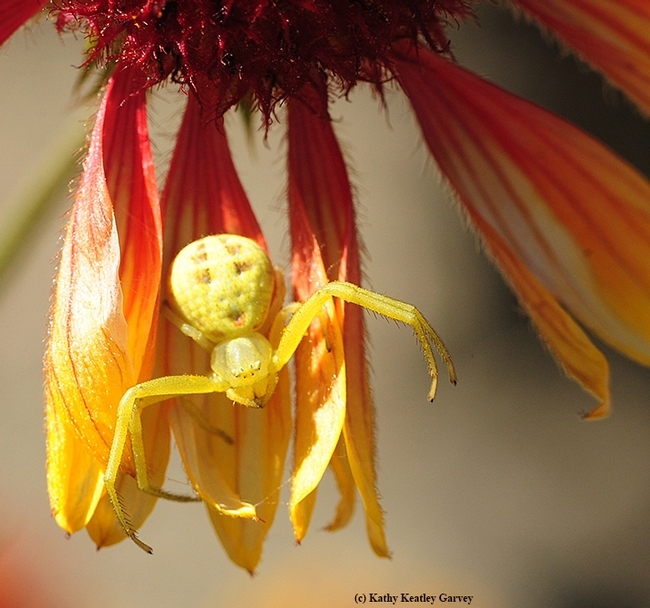 One study conducted during a freshman entomology class at Colorado State University found that "the most commonly mentioned specific factor in spider fear was bites and the perceived danger of spiders with figures indicat[ing] that spider fear levels of college students in Colorado are substantially higher than those reported from European general populations. "But are spiders the nightmare they've always been portrayed to be? Do they bite? Do they carry diseases? 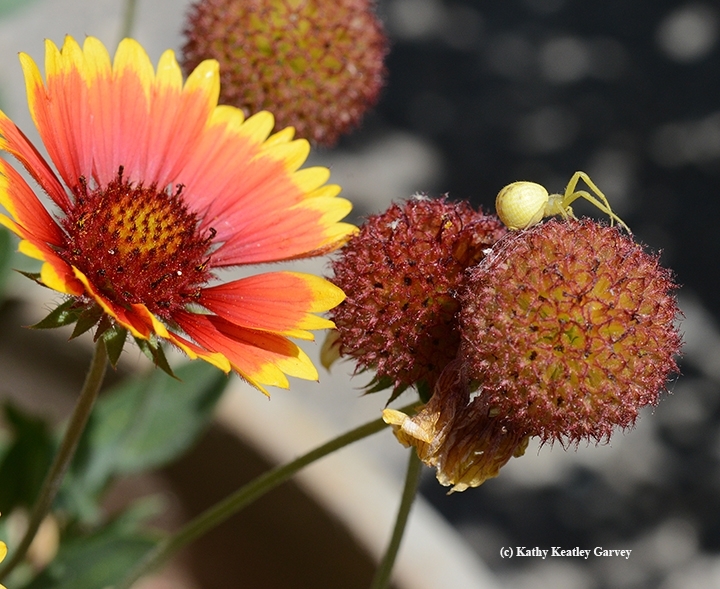 Are brown recluse spiders everywhere just waiting to strike? "First of all, a lot of those spider bites you've heard about weren't actually spider bites. 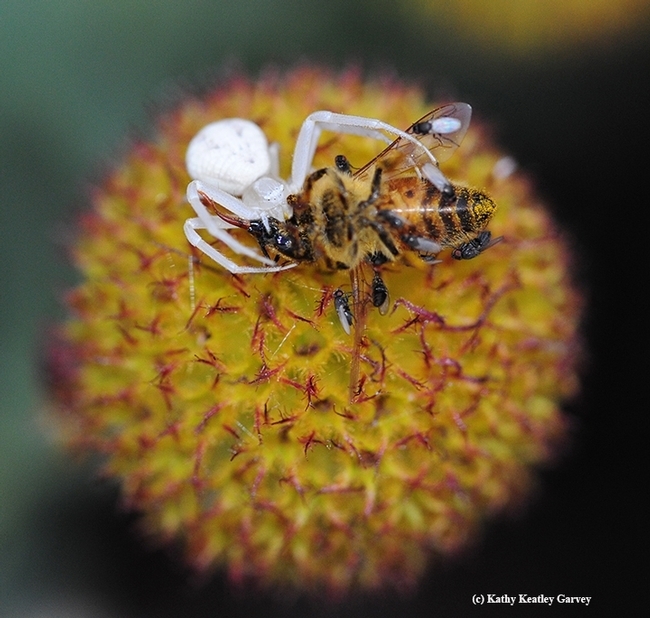 A study in the Journal of Medical Entomology has shown that there are several medical conditions that can be commonly misdiagnosed as spider bites including "bacterial, viral, and fungal infections; vasculitis; dermatological conditions; bites and stings from other arthropods; and miscellaneous causes such as allergies or drug reactions, chemical burns, reactions to poisonous plants, or diabetic ulcers." The study also expanded on the idea that Hobo Spiders are disease-transferring which it turns out, they are not. Other common house spiders have also had their name cleared when it comes to spreading MRSA." The ESA then turned to the brown recluse spiders, pointing out the misidentification and the false information about bites: "Take this study where an infestation of 2,055 brown recluse spiders was collected in a Kansas home that a family had been living in for many years, all without ever receiving a spider bite." "So that spider in your cupboard?" ESA asks. "Probably not a brown recluse. It's probably not carrying a disease. And it may have just killed a tick for you. So try saving a spider today, it's worth it." The last time I saw a spider was on Valentine's Day, Feb. 14. 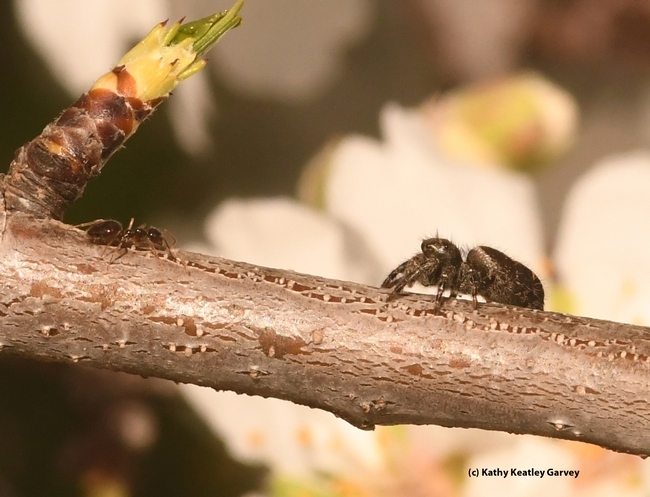 It was a jumping spider perched on an almond tree on Bee Biology Road, University of California, Davis. It had crossed paths with a winter ant (Prenolepis imparis). Neither wanted to be anyone's Valentine. Neither needed saving. 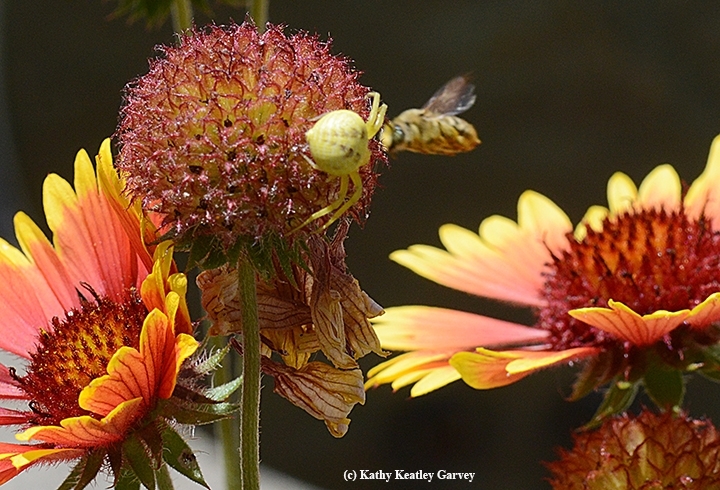 But I distinctly remember the other spiders I have seen and photographed in our pollinator garden. They didn't need saving, either. Well, perhaps the prey needed saving...but everybody has to eat! UC Davis Arboretum Plant Sale on March 10; Why Not Think Gaillardia? 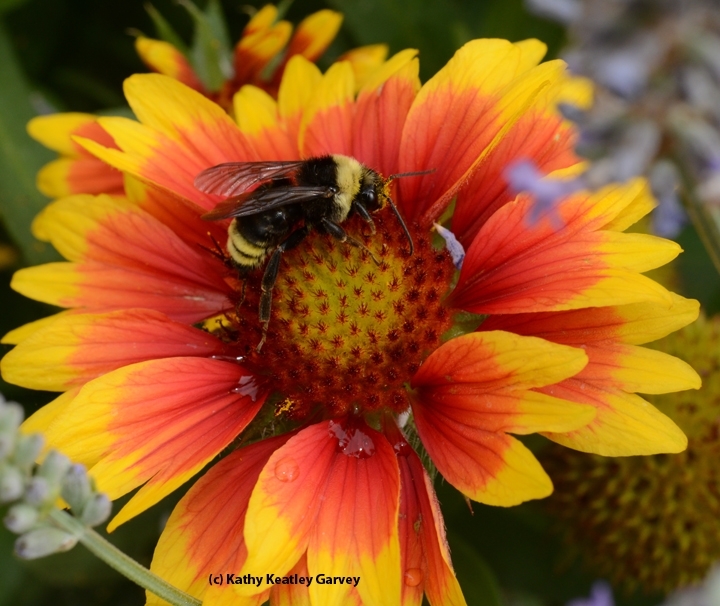 If you've been thinking about blanketing your garden with blanketflower (Gaillardia), you're in luck. 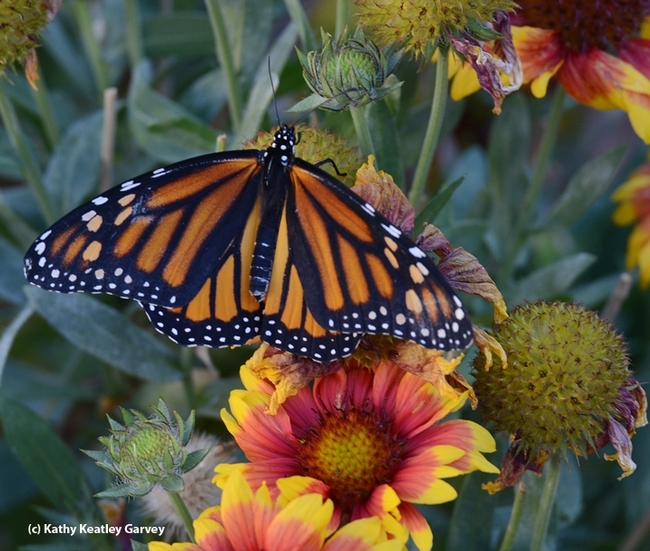 The UC Davis Arboretum and Public Garden is hosting a spring plant sale from 9 a.m. to 1 p.m., Saturday, March 10 at its Arboretum Teaching Nursery on Garrod Drive, located across from the School of Veterinary Medicine. And Gaillardia will be available. The one-ace nursery "has an incredible selection of Arboretum All-Stars, California natives, and thousands of other attractive, low-water plants perfect for creating a landscape alive with environmentally important pollinators," officials said. 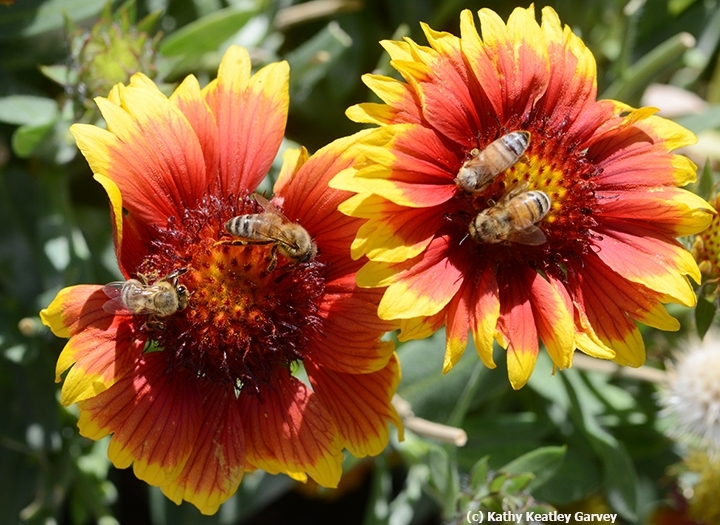 Gaillardia is a favorite among pollinators, including honey bees, bumble bees, butterflies, hummingbirds, and syrphid or hover flies. 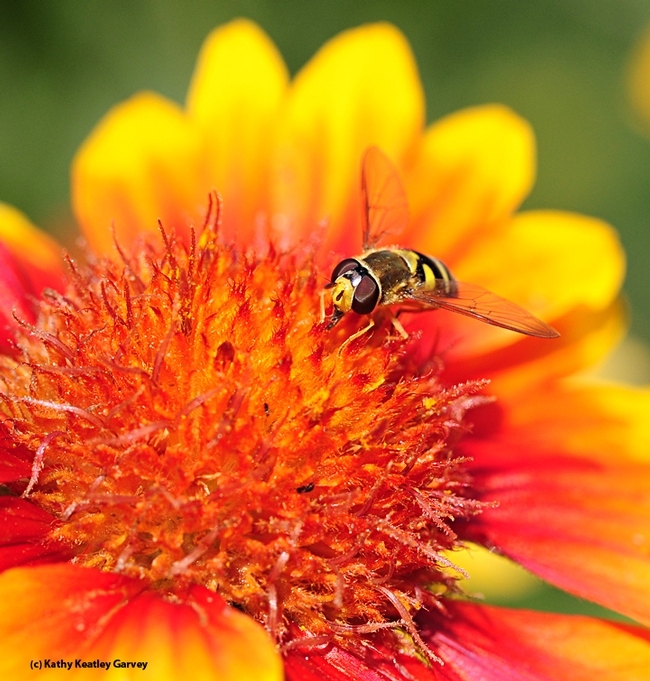 You'll see them buzz, fly or flutter over to it. 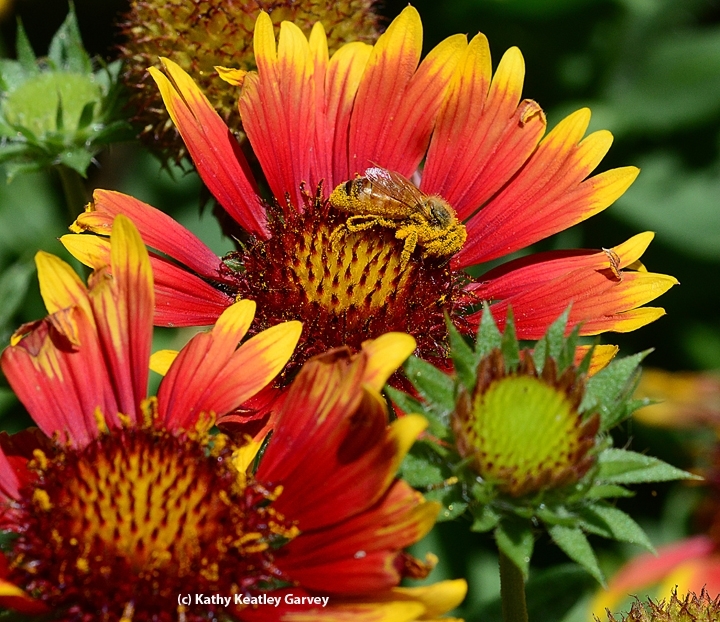 It's a member of the sunflower family Asteraceae, and native to North and South America. 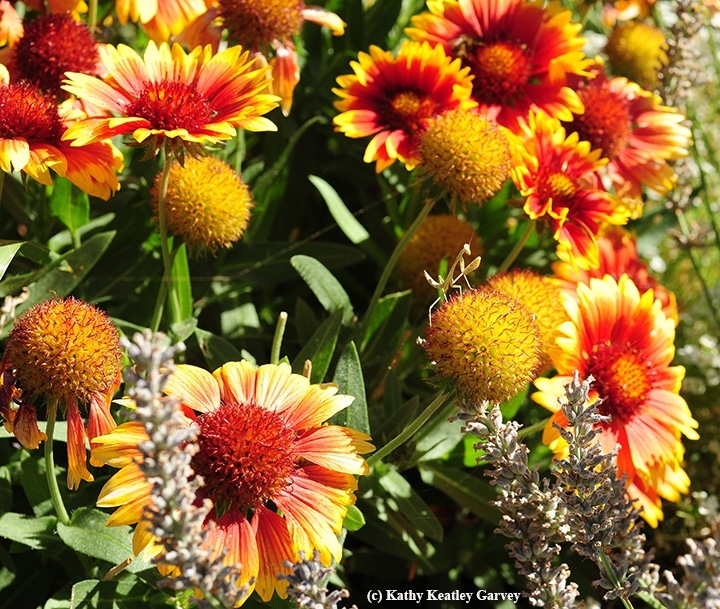 Named for M. Gaillard de Charentonneau, an 18th-century French magistrate and botany enthusiast, the plant is commonly called "blanketflower"--probably because it's reminiscent of the colorful blankets crafted by the native American Indians. 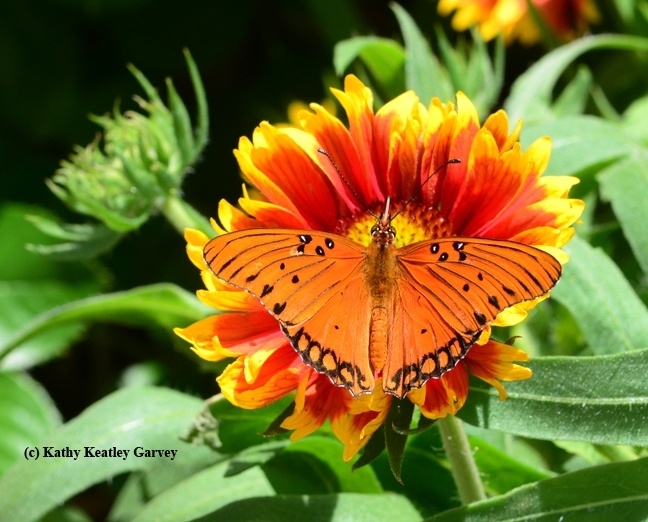 The plant sale is a "Membership Only Appreciation Sale," but you can become a member online now or at the gate on Saturday. Members receive 10 percent off their purchases and an additional $10-member appreciation gift. New members will receive an additional $10-off coupon as a thank you for joining. 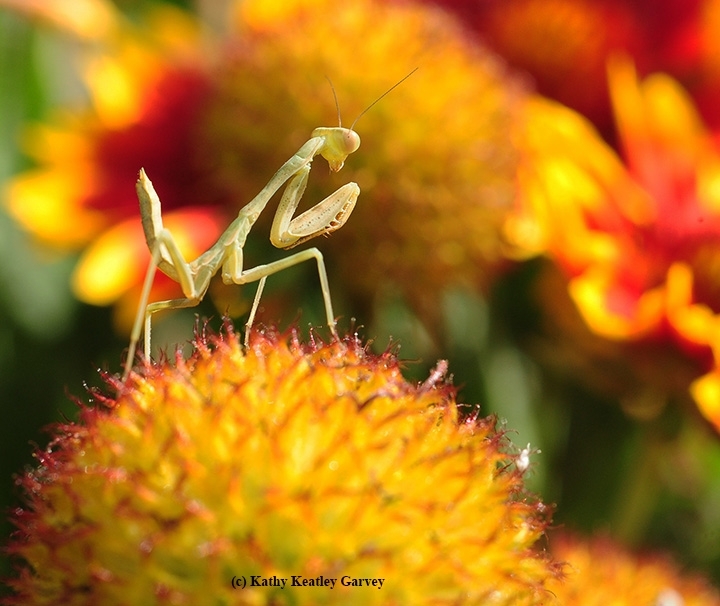 Davis Botanical Society members also receive a 10 percent discount on their plant sale purchases. Here's a list (PDF) of what's being offered. Plant them and they (the pollinators) will come. 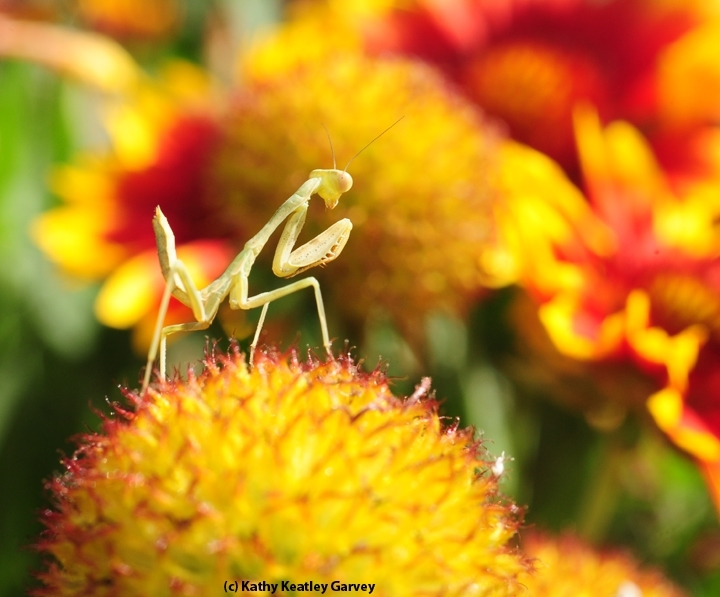 And sometimes you'll see a little predator-prey interaction--like a praying mantis lying in wait--but that's okay, too. Everybody eats!